Drones have inevitably become a popular gadget to have. In this ever-growing tech world, who wouldn’t want to have a flying robot? For the most part, unless you’re using them for military purposes, the majority of the drone-owning population uses their gadget for fun and entertainment. However, if you truly love flying your drone, why not utilize your flying skills in a way that could earn you some extra income? While you will have to look into getting a permit before using your drone for business purposes, there are lots of great options to earn extra income in a variety of fields. 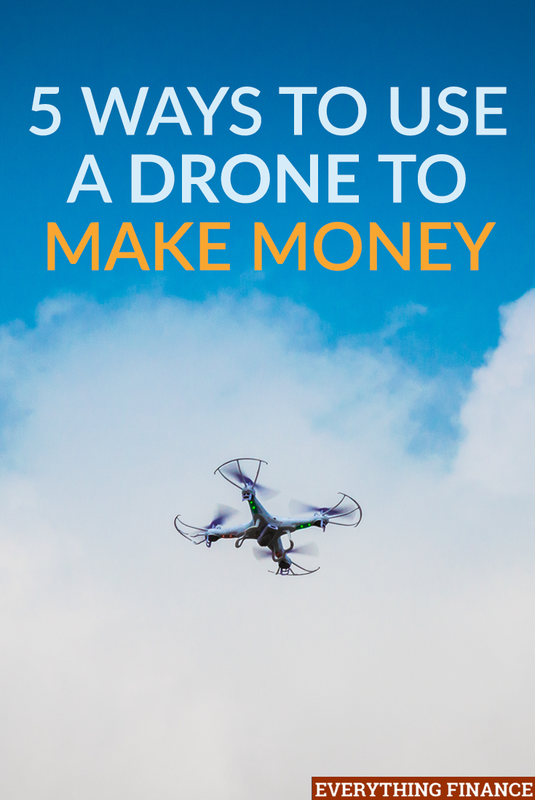 Here are a few ways to use a drone to make money. Couples getting married are always looking for new and exciting ways to make their big day special and truly capture the moment. Enter: the new business of drone wedding photography. While many clients choose to have traditional photographs as well, utilizing a drone for photos can give couples the opportunity to receive some unique and special pictures. This is especially true for destination or outdoor weddings; think a beautiful shot of the happy bride and groom with the sunset or landscape in the background. Although this is possible with other photography, drones give you the opportunity to really capture beautiful surroundings. If you’re unsure about going out on your own, you can even consider teaming up with another photographer to help them get some distinct pictures. Either way, you can opt to charge by the hour or a flat fee that could provide a nice monetary surplus. Of course, it may pay to think outside the box on photography, as weddings aren’t the only event that will jump out with opportunity for more specialized images. While this line of work may require some more experience on your part, and possibly a more technical drone, this is one way to use your drone in business that is likely to guarantee you a steady supply of work. Multiple fields and industries, like topography, map making, construction, and agriculture, all require detailed pictures and videos of their projects and land to give them a much-needed aerial display. Although this used to be accomplished through the use of helicopters or other small aircrafts, drones perform the same duties at a much smaller price. Furthermore, unlike traditional aircrafts, drones have the ability to fly lower, ultimately giving companies and clients an even better and more detailed view of their land. This allows companies to thoroughly inspect land or a site before they officially decide to purchase. This is one business market that would allot you a variety of options to use a drone to make money. Resorts, golf courses, ski lodges, and amusement parks all utilize well-taken photographs to sell themselves to potential consumers. However, it can be next to impossible to fully capture the beautiful mountains and runs at a ski lodge or the long, glistening coast at a beachside resort, with traditional photography. You could never fully capture the experience or scenery with ground level shots. Hence the appeal of drones and their aerial photographs that have the ability to capture the bigger picture. Look for companies that might need the visuals a drone can provide to successfully advertise their terrain. If you have good design and marketing skills, you may even be able to offer these businesses a complete package option for their advertising uses, too. Have you ever seen a spreading fire, traffic accidents, or riots on the news? Considering the danger each of these situations pose, it’s probably not likely for a reporter to be close enough to take a phenomenal shot. While it does happen on occasion, there’s a good chance those photos were taken by none other than drones. Although you wouldn’t use these small robots for weather-related photos, for obvious reasons, they can be a fantastic way to capture news-worthy shots that would put a reporter at serious risk. Moreover, drones can be a great way to capture sports shots. Professional teams and organizations often control all media training, which could be difficult to break in to. However, local news stations often report on their college and high school sports, which could be a great place to start. You may want to consider reaching out to your local newspapers and TV stations to either form a partnership or see if they’d buy a one-time photo. Like its use in advertising, real estate is another great market to use your drone in. When prospective buyers are looking for their perfect home, aerial views of the entire property could be used to the seller or agents advantage. Whether someone is in the market for a home or commercial site, aerial photos can give them a much better picture of the entire lot before they purchase. You may find better luck (in terms of houses) with higher-end homes; think $500,000 and above. High-end properties tend to come with more acres and can include multiple buildings or entertainment areas that a buyer would want a full view of. After all, the way a home is photographed usually determines a buyer’s first impression and can make or break a house’s appeal. When used creatively, drones can be so much more than just a form of entertainment. If you love flying these small robots, why not find ways to use them to increase your income? Keep in mind, however, that you may want to sharpen your flying skills before trying your hand at a drone business venture, as it’s always important to make sure you’re entirely comfortable and well-practiced at any skill before going professional. Nonetheless, no matter what field piques your interest, if you can build a portfolio and gain a good client base, you could quickly be on your way to building a successful photography and video business with the help of your robotic friend. Can you think of any other ways to use a drone to make money? Have you thought of any of these before? Do you own a drone?